Guaranteed Protection Guard Dog's Concealed Stun Technology is the best in the industry. Our keychain stun gun provides easily accessible, immediate protection from a potential attacker. Loaded with 6 million volts and a 3.6 milliamp audible zap, your attacker will be immediately disabled with a push of a button, giving you valuable minutes to escape. 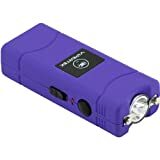 Stun Gun Flashlight A keychain stun gun is a must have for anyone venturing out alone, at night or into unfamiliar areas. With a bright 3 LED flashlight, shine it into your attacker’s eyes to buy you time or light up a dark corner or path. 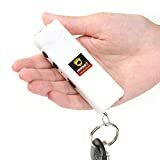 The World’s Smallest Stun Gun As light as a tennis ball at just 2oz, Guard Dog’s Hornet Keychain Stun Gun is easy to carry, easy to reach for and easy to use. Keep it close at hand with your other keys or attach it to your bag, belt or clothing for even quicker access. It’s small enough to go unnoticed yet powerful enough to keep you safe. Guard Dog Hornet Keychain Stun Gun Features 6 million volt, 3.6 milliamp audible zap 0.5in thick, 4in long and 2oz Rechargeable battery Built-in keychain Safety switch Rubberized, non-slip grip Nylon holster with belt loop The Best In The Industry Guard Dog's exclusive Concealed Stun Technology brings you functionality that is truly practical. With no visible prongs on the top many of our unique flashlight stun guns, your security device is fully concealed until use. Don't trust your security with cheap knockoffs, Guard Dog's Concealed Stun Technology is the best in the industry. Safety is no accident. Buy your Keychain Stun Gun today! MTW-800 - Black Stun Gun 6.8 Million Volts - Rechargeable with Flashlight. Here you are looking at the perfect "You must have" little self-defense gadget that can stop any violent or dangerous activity. This is the strongest stun gun on the market you can find today. In most cases just pulling the trigger and fire stun gun in the air is more than enough to stop the attacker as the bright electrical light followed by the terrifying noise comes out when it fires up. Well and if it is not enough to stop the attacker than a simple touch of a powerful voltage this stun gun produces will definitely do the job. As it will create electrical shock and put your enemy down and prevent him from any further aggression giving u enough time to run away or call a police. This unit also features installed flash light, no battery's needed for stun gun to operate as it charges from any wall socket. In addition to a safety switch this stun gun features a safety pin which provides an extra safety. The safety pin needs to be inserted in the safety pin receptacle to enable stun gun to spark. If you do not need this extra safety feature you may keep the safety pin plugged in all the time. Defend yourself, defend your friends. Be safe. Due to restrictions in some state, county and city laws we do not ship to the following locations: Hawaii, Massachusetts, Michigan, New Jersey, Illinois, New York, Rhode Island, Wisconsin, District of Columbia, Annapolis, MD, Baltimore, MD, Chicago, IL, Philadelphia, PA, Baltimore County, MD, Crawford County, IA. Attention: You must be 18 years of age to order stun guns or tasers. Also it is the customer's responsibility to check with local ordinances to determine legality of stun guns in the home locality.